Posted on August 17, 2014 by They Said I Do. 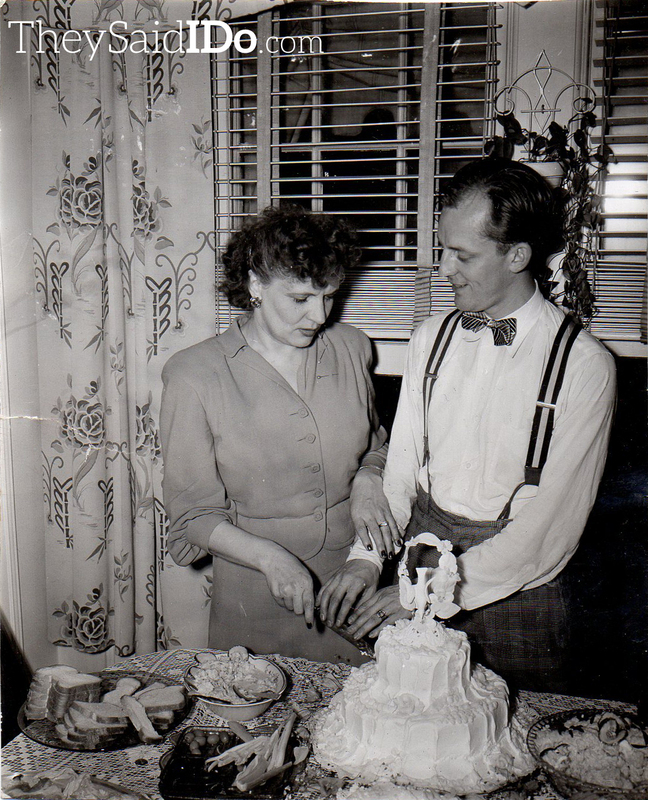 This entry was posted in Photos and tagged 1940s, bow tie, cake cutting, detroit, michigan, reception, tailored bridal suit. Bookmark the permalink. How cool that the dealer knew some background info! I wonder if the pair have any family left in the area…. P.S. I love the drapes! Hi Ryan, wow! I’m so glad you found this. So often I never know who any of the people in the photos I find are and I always wonder if there aren’t family members out there who would like to reconnect with the photos. Without the offhand comment when I purchased this, it would have remained just another interesting but anonymous photo. I would really like to know more about your grandparents’ story and your grandfather’s photography. I’ll follow up with you in an email shortly! Very interesting I know the family. Great people. I wish I had that dress she has on. Rod Rieser was like a second father. His son is one of my BF’s. A beautiful photographer. I got him a shot of Lee Iacocca being shot for his 1st Chrysler commercial. It was published by AP and UPI the next day. High tech then. Hi Mike, thanks for stopping by and sharing your personal connection! I can’t even tell you how thrilled I was to read these comments. I can only imagine what a great collection of photos he must have had. I grew up with their Son, Rick. They were like 2nd parents to me and always made me feel welcome in their Berkley home. Weren’t the 60s a great time in Detroit! Hi Pete, knowing that people who actually knew this couple are getting to see this picture really made my day! I wish I could get in a time machine to the 60s right now. Thanks so much for stopping by.